Learn about all the services we provide here at Mercy Home, from mentoring to tutoring and more. You can change a life and help your community simply by being a friend to a child in need. Mercy Home is only able to provide our kids with everything they need to succeed with your help. Your support will ensure that we save their lives and change the future of over 400 kids this year. Since 1887 we’ve changed the story of over 30,000 kids. Volunteering at Mercy Home offers you the chance to make a tangible, hands on difference in the lives of kids in need. Learn about all of the ways you could donate your time and expertise to help Mercy Home and the kids we serve. As the school year quickly approaches, we have a special need for tutors to work with our young ladies at our Walsh Campus in Beverly in the evenings after school. Learn more and apply now if you are interested in this meaningful volunteer opportunity! Request information on all of our volunteer programs below. Mercy Home’s Friends First mentoring initiative matches children in need with positive adult role models. Since 1987, the program has introduced more than 1,500 children to carefully-screened and prepared mentors and is currently supporting approximately 90 active matches in our community-based and site-based programs. Tutoring is an integral part of our volunteering program. Volunteers spend an hour each week with our kids during the school year, helping them with homework and encouraging positive academic habits. MercyWorks is a once in a lifetime opportunity for you to volunteer with about 16 other university graduates who want to dedicate their lives to improving the lives of others. Spend a year with us and gain professional experience while growing spiritually, personally and professionally. Every year, hundreds of extraordinary men and women—our Mercy Home Heroes—support our children by taking on extraordinary personal challenges and planning creative events to help us raise funds and awareness. Every March, thousands of volunteers take to Chicago’s streets to raise critical funds that give Mercy Home’s kids a safe, loving home, clothing, meals, and a warm bed away from traumatic pasts. When a friend has a physical injury, we encourage them to see a doctor. Why don’t we do the same when a friend is hurting mentally? Untreated mental illness can lead to trauma. Mercy Home for Boys & Girls is asking you to sign its online pledge to help end the stigma of mental illness. Recognize the signs of abuse or neglect, and engage in a discussion with family and friends, to help save young lives. Together, we can influence others by our own example. You can help advocate for policies and programs that promote healthy families. Sign the pledge to commit to becoming more aware of the issues behind child abuse and to help support children and families in crisis. What’s better than shopping online and donating at the same time? Take a look at all the affiliated online shops to get a % donated to Mercy Home. A special thank you this week to our friends from Divine Mercy Crusade; and Saint Joseph’s Parish, Libertyville in the congregation. Please take a quick survey regarding your nightly tutoring experience. Volunteering at Mercy Home offers you the chance to make a tangible difference in the lives of a kid in need. Learn about ways you can donate your time and talents to help Mercy Home and the kids we serve. MercyWorks is a once in a lifetime opportunity for you to work with about 15 other university graduates who want to dedicate their lives to improving the lives of others. Spend a year with us and gain professional experience while growing spiritually, personally and professionally. We need hundreds of volunteers to help our Mercy Home Heroes Marathon team have a fun and successful race! Volunteers are needed in 3 to 4-hour shifts starting as early as 5 a.m. and ending as late as 5 p.m. Our Marathon Cheer Station is located at Mercy Home’s West Loop campus, (1140 W. Jackson Blvd), where the Chicago Marathon passes us at mile 16. The Hero Headquarters is located at DePaul’s Loop Campus, (1 E Jackson Blvd). Job Lab Tutoring: Our Job Lab welcomes professionals from all backgrounds into Mercy Home to coach our youth through key job skill development activities. Learn more. MercyWorks: MercyWorks is a once in a lifetime opportunity for you to work with other recent college graduates who want to dedicate their lives to improving the lives of others. Group Opportunities: Mercy Home only has a few group volunteer opportunities – Mercy Home’s March for Kids during the month of March and the Bank of America Chicago Marathon, the first Sunday in October. To be added to the email list for these volunteer opportunities, please check “Event Volunteering” in the form below. Corporate Opportunities: Mercy Home has many opportunities for you and your colleagues to volunteer together as a group. From painting fences to volunteering at an event, we have options for corporate outings. Please contact us for more information. Please fill out the form below to receive more information about the volunteer opportunity of your choice! Far too many children face limited opportunities for growth and experience repeated disappointment from adults. In response to this need in the community, we created the Friends First Mentoring Program. The program matches a child one-on-one with a well-trained volunteer mentor. Many underprivileged children have not ventured far outside their neighborhoods. Friends First outings range from a visit to an art museum to a stroll on a college campus to simply playing Frisbee in a park. Through connection with a trusted adult and exposure to activities, a child can develop a better vision for his or her future beyond the limited horizons that hold back far too many children. If you know a child in the Chicago area who could benefit from a mentor, please get in touch. We have kids on waiting lists at this very moment who could use a mentor. Every child craves one-on-one attention. With classrooms stretched, families burdened, and after school programs cut, many children like those we serve in the Friends First mentoring program lack this needed attention. Our Friends First mentors allow a child to ask questions, share insecurities, and seek advice from a trusted Friends First mentor. 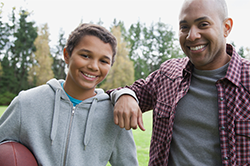 The Friends First Mentoring Program offers support and referral services to families to help address the underlying challenges that impact many of our children and families. A study by Public/Private Ventures concluded that children with mentors are less likely to start using drugs or alcohol, and are less likely to skip school. And thanks to the work of our volunteer mentors, we see these successes and more in the children we serve.